The Golden Years of life can be the most enjoyable, relaxing years for aging Americans when they are well planned for. Life does not end at retirement, but very few people plan beyond that. By 2030, the Census Bureau projects there will be about 71.5 million older persons, but only 5 million people are currently covered by long-term care insurance. 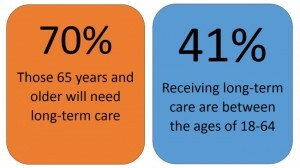 A plan for long term care should include the desires of those who are aging for both informal and formal care. Perhaps they desire to stay in their home and on their own; perhaps they would prefer to live with children or other family. Some enjoy the company of others their own age along with the ease and peace of a nice retirement community or formal facility. These wishes should be discussed with family, and planned for with the appropriate long-term care insurance option. On average, nursing facilities cost $150 to $300 per day, which is more than $80,000 a year. 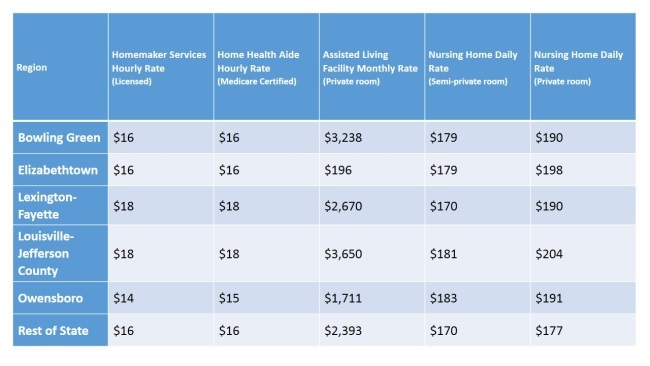 Even occasional at-home care can cost upwards $10,000 each year. Long Term Care insurance policies are designed to help ease the financial burden of long-term care regardless of whether it is occasional home health visits, or a complete move into a nursing home facility. 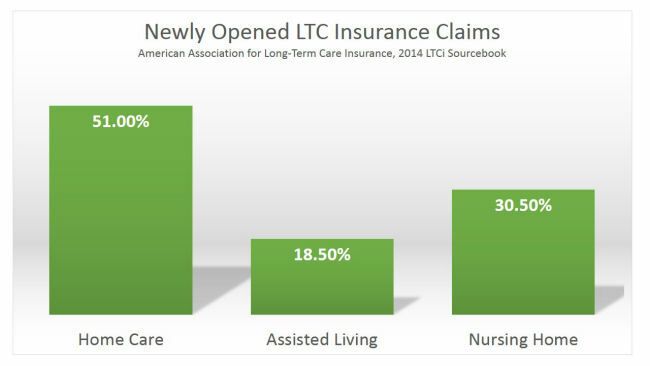 Long Term Care Insurance (LTCI): Insurance available through private insurance companies as a means for individuals to bear the high costs of long-term care. Activities of Daily Living (ADLs): ADL refers to the daily activities people do independently such as eating, bathing, dressing, using the toilet, etc. ADL's are often used as a measure of functional ability. Adult Day Care: Social, recreational and/or rehabilitative services provided in the community for those who may need help during the day but are able to live at home at night. Alternate Facility: This refers to licensed residences other than a skilled nursing facility. This generally includes hospice, assisted living, or Alzheimer's units. Alternate Plan of Care Benefit: Payment for specific needs to allow a person to stay at home while aging such as ramps, grab bars or other necessary at-home medical equipment. Aphasia: Loss of the ability to use or understand language. Assisted Living Facility (ALF): A non-medical institution providing room, board, laundry, minimal personal care, etc. for aging adults who can still care for most of their own activities of daily living. Benefit Period: The maximum number of days that a policy will pay the daily benefit. Benefit periods are often purchased in terms of three years, four years, or unlimited. Caregiver: The key person (usually a relative) overseeing and providing the care for a person who is incapacitated. Chronic Care: Care for an illness continuing over time or recurring frequently. Cognitive Impairment: Refers to the loss or deterioration of mental capacity. This includes conditions such as dementia or Alzheimer's disease. Custodial Care: Services that can be given safely and reasonably by a non-medical person such as feeding, bathing, and dressing an individual. Also referred to as Personal Care. Daily Benefit Amount: A specified, maximum, daily dollar amount payable on a covered period of care. Elimination Period: A specified time period of covered care where no benefits are payable. 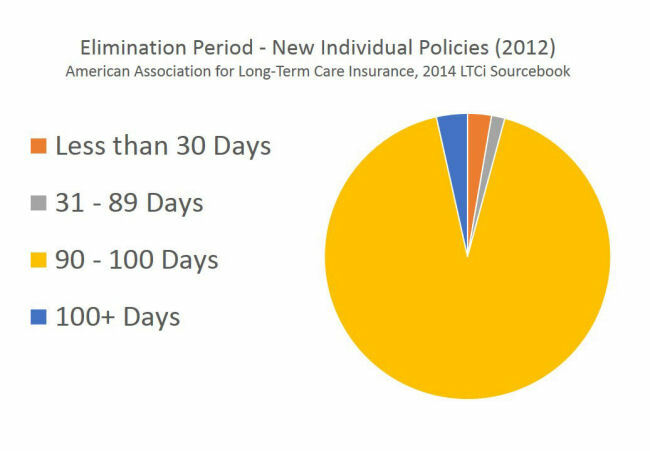 This is the deductible of Long Term Care, and should be chosen based on the longest period that you could sustain care costs on your own. Home Health Care: Care delivered at home such as physical therapy and home personal care. Homemaker Services: Assistance given in managing and maintaining household activities such as meal preparation, laundry, cleaning, chores, etc. Inflation Protection: Increases the daily benefit amount on an annual basis. Intermediate Nursing Care: Daily, but not 24-hour, nursing supervision ordered by a physician and supervised by a registered nurse. Nursing Home: A facility that provides room and board and a planned, continuous medical treatment program, including 24-hour-per-day skilled nursing care, personal care, and custodial care. Respite Care: Temporary nursing home or home care. Skilled Nursing Care: Nursing and rehabilitative care 24-hours a day & ordered by a physician either in a facility setting or at-home. The definition of Skilled Nursing Care may vary between policies. Waiver of Premium: Allows the policyholder to stop paying premiums once they are in a period of covered care. Usually applies to only to a facility stay, and requirements vary between companies. According to the U.S. Department of Health and Human Services, about 70 percent of individuals over age 65 will require at least some type of long-term care services. Some may be minimal, but that does not mean they will be cheap. Caregivers come in many different forms. The most common caregivers are middle-aged children caring for their elderly parents. There were 39 million persons age 65 and older in 2010. More than 69 million people spend time each week engaged in family caregiving, that’s an estimated two people caring for every senior citizen each week. Reimbursement. This policy is the most common policy. It is designed to repay the insured for long-term care expenses. Under this plan, you receive reimbursement only after expenses are incurred. Indemnity. This policy provides benefits on a daily basis for every day care is received. Cash Benefit. 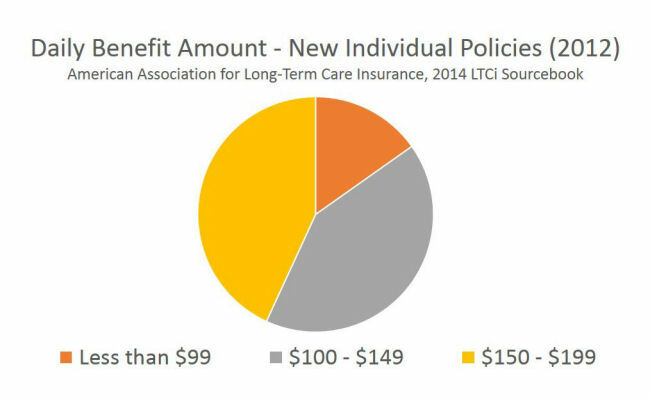 A cash benefit long-term care insurance policy provides a lump sum cash benefit as specified in the policy once policy requirements are met. In addition to the major policies, there are additional benefits, restrictions, and guidelines associated with each plan. Individuals of all ages can require long-term care; because of a serious accident, an illness, disease, or a cognitive impairment. Generally, in order to receive benefits from a long term care insurance policy you must be certified by a licensed health care professional as being unable to complete two of six defined Activities of Daily Living or suffer from a cognitive impairment which prevents you from being able to care for yourself. Daily Benefit Amount: This is the maximum amount your insurance company will pay per day for your care once you become eligible to receive benefits at home or in a nursing home. Benefit Period: This component determines the length of time your insurance company will provide benefits. Elimination period (or waiting period): The elimination period is the amount of time an individual will be required to wait prior to receiving benefits from their policy. The elimination period may be 30, 60, 90, 180, or even 365 days. The elimination period is much like a deductible. Inflation protection: This increases benefits in order to protect against the effects of inflation. The most common inflation protection increases the daily benefit amount each year by 5% from the previous year. This is particularly ideal for those who are younger when they buy a policy. Non-forfeiture Benefit: This is also known as "return of premium" which returns a portion of the paid premium after a period of time or upon death. Zero Day Home Health Care Elimination Period: This option may waives the elimination period for home health care if the individual has been certified by a license professional as being eligible. Survivorship Benefit or Waiver of Premium: If you and your spouse purchase coverage at the same time, from the same company, with the same benefits, this policy will waive the premiums once one partner passes away or begins to receive care. The average cost of nursing home care in the United States is $70,445 per year. The average nursing home stay is approximately 2.5 years. Over the course of three years, the cost can top over $200,000. For the 20 percent of individuals who will be in nursing homes for five years, that’s over $350,000. Each year, these costs increase. The average first-year premium for individual coverage purchased in 2011 was $2,279, up 6 percent from 2010. Without Long Term Care Insurance, this cost is left to retirement, personal savings, or family. 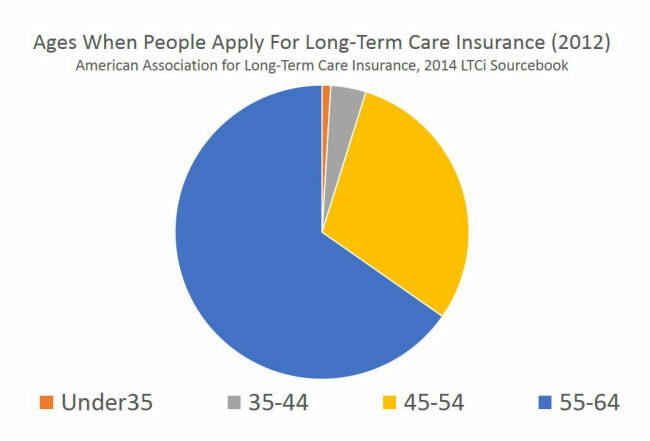 The specific cost of long-term care varies by state. In Kentucky, a home health aide charges an average of $17 hourly or $38,896 annually to assist individual activities of daily living. For household duties such as laundry and cooking, that adds an additional $17 per hour. Nursing home care costs $207 a day or $75,555 annually for a private nursing home room. How much does long term care cost in Kentucky? When shopping for a long term care policy, terms, provisions, the process can quickly become confusing and overwhelming. Here are a few of the key features to look for in any long-term care policy. Look for a policy that will pay for care in a variety of locations including a nursing home, assisted living facility, or at home. This provides the policyholder with options as they age to choose what is appropriate for them. The inability to perform two or three specific "activities of daily living" without help. Cognitive impairment diseases that are not included such as stroke, Alzheimer's, or other mental impairments. Certification requirements by a doctor. Some policies require a hospital stay of at least three days to get benefits. Waiting Period: A Waiting Period is a time period in most policies in which the policy will not pay benefits. In general, the longer the waiting period, the cheaper the policy. Term: Once benefits begin, the benefit period for any policy may range from two years to a lifetime. A policy with guaranteed renewals is often a priority, your price may increase, but this provision will guarantee continued coverage. Payment: The most common policies work on a reimbursement basis. Two other features to look for are the waiver of premium provision, so that no further premiums are due once you start to receive benefits, and the third-party notification, so that a third party will be notified if you forget to pay a premium which can save you from being dropped for non-payment.